Furring or the use of furring strips (sometimes misspelled “firring”) is the use of narrow strips of wood usually attached to a wall, ceiling or floor. There job is to create a true plane on which to attach or strap flat surface materials. To “fur” then, means to build out a wall or ceiling in order to create a level or plumb a horizontal or vertical surface. See photos. Let’s take a look at a few of the most common applications for furring strips. Picture an unfinished basement. Usually thick, bare walls of sheer concrete are all around you. The texture often looks rough, with divits, seams and other imperfections scattered all aross the surfaces. This just comes from how they were made. At one time a forming contractor poured cement into big molds to create these walls. Not much care is given to how smooth everything comes out. Depending on how old and/or how good the forming process was will determine how even these walls are from side-to-side and bottom up. Other basement walls may be made brick and mortar style or with larger pieces like cinder blocks. These too can create patchy and uneven walls in your unfinished lower levels. These thin pieces of wood can be attached securely to concrete using special fasteners like masonry screws or sleeve anchors. Get your SDS hammer drill and appropriate drill bit out! Furring the wall is like putting wooden bars up in order to easily hang smooth wall-board. A furring piece serves the purpose of a wall-stud just like you have in the other, livable spaces of your house. You even mount furring strips 16-inches on center just like regular 2×4 studs. This will make hanging drywall or any kind of paneling a snap. 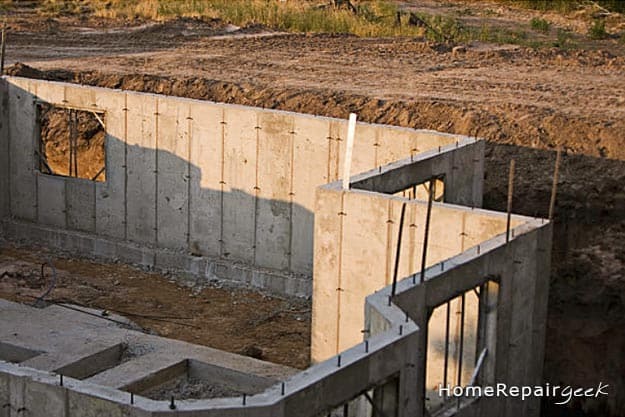 And structurally, they’ll provide the uniformity required for a wall that’s flush and level. That’s not to say you can’t use regular framing members for a wall. You can…it’s just that furring will be a lot cheaper and much easier to install. You may be in a position where furring won’t actually work. For example, if you want to use regular batt (blanket or roll) insulation. You’ll want the extra depth within each bay. As an alternative, you can consider spray foam insulation. It can bring you the similar R-values and use up less space. Also, while furring can create enough space for wiring and small copper pipes that are flush to your walls, you might not have enough room if pipes are laid out at a distance using brackets. Or, if pipes are larger, then traditional studs will be your best option after all. Basements and attics alike that wish to have their exposed joists covered with drywall can benefit from furring strips as well. This can be extremely useful if you’re adding lighting and don’t want to bore out holes to run wiring. The thickness of the furring will be just right for typical Romex wires. Tack on your furring strips, and you’ll be ready to go.